This box contains 5 kg of sweet and refreshing tangerines and 10 kg of Table oranges with smooth pulp and big sized, containing also a big amount of juice inside. Tangerines, very convenient to eat, as their peel detaches easily by hand. Table oranges, well suited to be enjoyed during breakfast or desert. They also offer great amount of cooking possibilities. 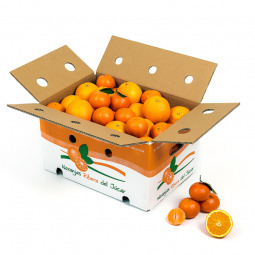 Our Juice Oranges are grown in Carcaixent, Valencia´s village known as "The Cradle of Oranges". Thanks to their taste and natural freshness, are capable of satisfying the most demanding gourmets. Oranges are a great source of Vitamins and really healthy. Well appreciated for their high Vitamin C content, but not the only one. They also have Vitamin A, most of Vitamin B complex, Vitamin E and flavonoids. All these reinforces immunity system and cells tissues. Due to their high Phosphor content, they are good to keep good memory as well. They have diuretic action, so helps purify liver and kidneys. Also great detox properties. We grow our fantastic oranges with all our care and refinement, so that you can get as much their outstanding properties. We strictly supervise the whole process in order that the best of our extraordinary oranges, get to your table. Taste the difference!